Gucci stag brass stirrup cup signed, Italy, 1970s. 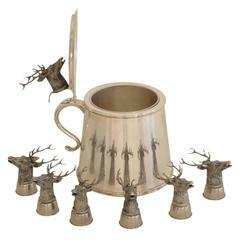 Can be displayed as pictured or with the cup upside down, resting on the stag's antlers. Signed Gucci with impressed marked. Set of 4 silver plate stirrup cups by Gucci, Italy, circa 1970s. 2 horse and 2 wolf. Gucci vintage silver metal horse heads cup, Italy, 1970s Marked GUCCI ITALY. 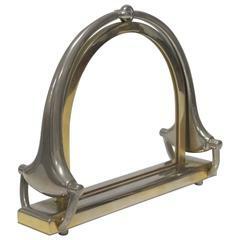 Great midcentury equestrian piece. Measures: Height 5.5 inches - 14 cm Cup's diameter: 3 inches - 7.6 cm. Listed is a fabulous, set of four, 1970s Italian brass champagne flutes with a hammered look. Heavy, weighing nearly 3lbs for the set of four.